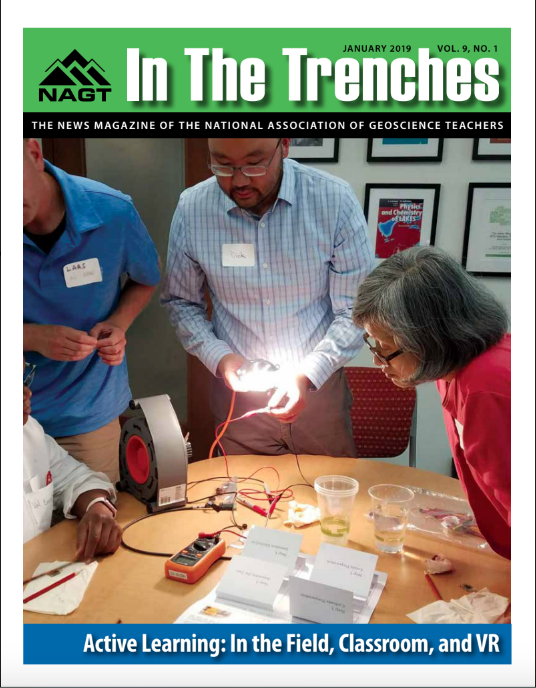 In the Trenches is a full color, 16-page hard copy publication, designed to provide a forum for geosciences education dialogue targeting educators in the classroom. It provides a venue for contributors to inform NAGT members about their best teaching ideas, resources or other special topics relevant to our profession that do not lend themselves to more research-focused journals. The idea is to provide a more informal outlet for ideas and experiences that can inform the larger community. While the overall format varies from issue-to-issue, each volume includes a variety of articles, columns and reviews. Each edition includes a color cover photo highlighting an education experience, resource or situation. Every issue has a short lead article (around 2000 words) that is reviewed by the editor and one or more members of the Executive Committee. That lead article will be on a topic of broad interest to a major segment of our membership. In the Trenches also includes several sidebar columns. Some sidebars span several issues, others stand alone. Examples include classroom-ready K-12 resources, teaching in large classes, using research data in the classroom or assessment strategies. Book reviews, descriptions of geosciences educations software or datasets, biographies of leading geoscientists or other general interest materials are also welcome. Other short items include descriptions of active-learning lab activities with links to the resources needed or more lighthearted material such as classroom quips or member musings. When possible, we include news bits that highlight upcoming events in regional sections, NAGT business items, networking and mentoring opportunities or advertising relevant to teachers in the classroom. Our goal is to provide a useful, but more casual resource that serves your needs and becomes a favorite publication on your routine reading list. To supplement the print publication, each issue of In the Trenches will have a webpage where links from the issue can be accessed and additional information will be posted relating to the theme of the issue. Additional web resources and news items will also be publicized via this webpage. Members wishing to contribute ideas for content can use the Content Suggestion form to submit their ideas to the editors. Members wishing to write a letter to the editor that reflects or responds to recent content in the journal can do so using this form. Information on advertising is available on the In The Trenches Advertising page.